Executive Lunch Buffet For Rs. 131 Only is an event that took place between 01-Feb-2006 and 30-Jun-2007 in Hyderabad. Twister Restopub books your afternoons as well with its sumptuous Executive Lunch Buffet. The cuisine is Indian so you can pig out and feel right at home during the welcome break from work. In addition, there is a free complimentary pint of beer or soft-drink so you can cool-off and stretch a little, and be right back in shape for work. 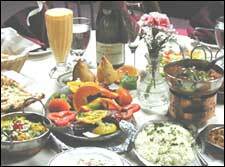 The menu consists of 2 non-veg dishes (Punjabi chicken, Nawabi chicken etc. ), 2 rice dishes, 2 dals (Tomato dal, Dal Makhni etc), rotis and nans, 3 veg dishes (Subzi Chutney Masala, Bhindi Do Pyaza, Dhingri Matar etc), Soups (veg noodle soup, veg Goldcoin), 1 dessert (Gulab Jamun, Gajar Ka Halwa etc.). The meal comes for Rs. 151 + taxes and is on from 1200 hrs to 1530 hrs everyday. For further details, please contact 5553-8558. It was such a cool experience to take my team out for a team lunch.The food was great and the ambience is like awesome.I would want to try them in the evening too with my team. fullhyd.com has 700,000+ monthly visits. Tell Hyderabad what you feel about Executive Lunch Buffet For Rs. 131 Only!